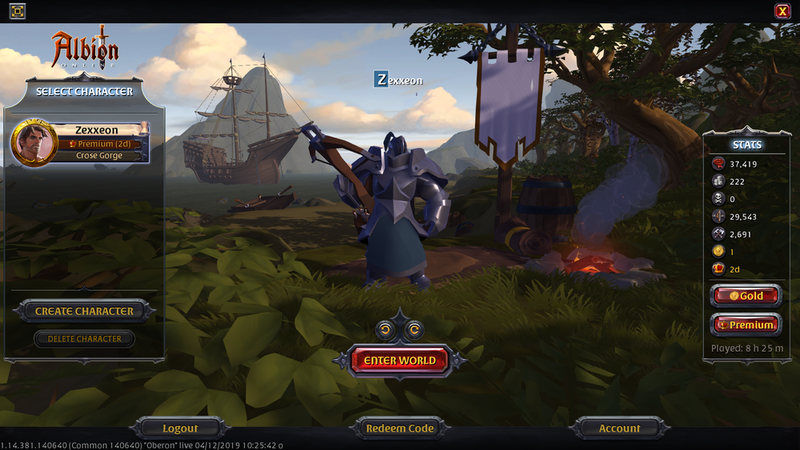 On the 10th of April, Sandbox Interactive’s Albion Online, went free to play. I was very curious about the game and have been meaning to look into it, so I jumped right in. I completely forgot that whenever these types of games go free from a premium state that I'd be jumping in along with a huge crowd, ending with me sitting in front of a login screen with a large queue. This just means that I had to play in the afternoon during the blistering heat in the weekend instead of the wee cold hours of the night. Albion Online is an isometric Diablo-like sandbox MMORPG which boasts a player driven economy in the likes of EVE online. Its main tag-line is "You are what you wear". Meaning every item bought from the store is crafted by a person, and each item you wear goes towards improving your character's skills, molding you into the type of playstyle you prefer. Be it an ironclad knight or a robed mage, you choose to adventure in your own self-made quests. The freedom of which you are given to customize your skills and play style is deep enough to get some pretty cool builds, and clothes combination customization out. I myself first sought out to play as a mage caster but then moved to playing an armored crossbow wielding ore miner. Just to get it out of the way - the game is very grindy. It isn't toxic grinding though, but rather the systems built into playing the game is inherently grindy in itself. As you adventure throughout Albion, each action you take adds to a meter you fill up to gain experience. Meaning, each tree or foe you cut down adds to your overall experience to be better at that sort of thing. 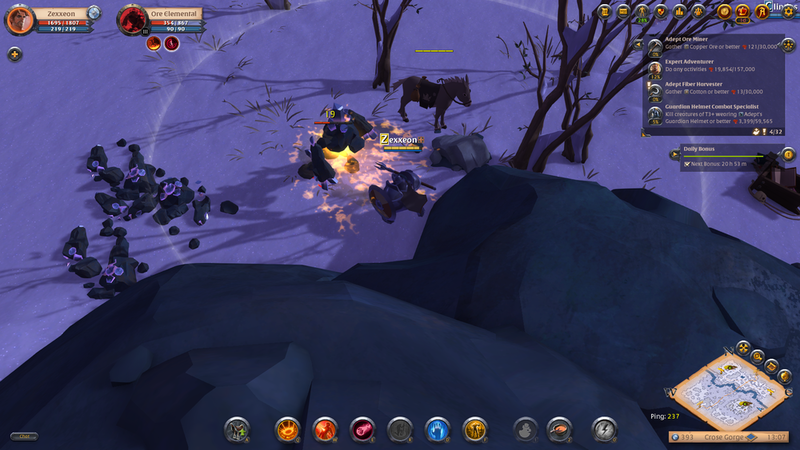 Graduating from a specific field, like mining, will grant the player more ores when mining. This may all sound overwhelming at first but jumping into it actually feels natural and easy. The game even starts out with a tutorial of how to go about things in the world. They'll teach you the normal stuff, like gathering materials and crafting them. After that, you're thrown into the wilds to start your own adventure with about 300 or so people in a town clamoring to cut down that tree just so they can gather wood to advance their crafting experience. Thankfully, trees grow back after 5 or 6 seconds and there are plenty of nodes to go around. There's never really a shortage of raw materials to craft stuff; it's just a matter of rushing to the spot first to gather materials before the other guy does. The hype over the game may die out within the month but my time in Albion was actually pretty pleasant. I actually like grinding for my meters to fill up, as it gives that sense of accomplishment when you do a chore and reap the rewards. The game is not "pay to win" but rather has the option to "pay to progress faster" which is how i like my MMOs. Now if only I could play this game on my Nintendo Switch in order to mine ores on the go, i’m all set. A top-down survival horror game that can keep you playing for hours in hopes of uncovering its secrets. Batman: Arkham Knight possibly the most definitive statement on the relationship between the Caped Crusader and his staunchest adversaries. The added realism might throw off newcomers, but the changes to cooking mechanics have a real impact on how you manage your time each day.